Are you looking for a fun craft project? Making these colorful flowers using curling ribbons may be the perfect one. I had many ribbons of different colors I no longer needed. Instead of throwing them out, I thought of making something useful and beautiful out of them. I just wasn't sure what. Then, I saw a cluster of daisies for sale in the craft store, and I immediately knew my curling ribbons could be turned into colorful flowers. Excited, I went to work. And the result is this amazing bouquet. 1. An assortment of different colored curling ribbons, approximately 10 meters long in each color (10 meters is enough to make two flowers). I have three different width ribbons: 0.75", 0.5" and 0.2". The wider ribbons can be used to make the larger sized flowers. 2. 16 gauge by 18" long pieces of floral wire. If you don’t have this size, you could use 18 gauge. I need 20 wires for my bouquet of 20 flowers. 4. Medium size vase. Mine is 8" high, clear glass with ruffles. 5. A roll of floral tape (optional). 8. A cluster of daisies (optional). 9. Small size clothes pins. You can find these in the scrapbooking section at your craft store. 10. Iron (not in the picture). I prefer 0.2" wide curling ribbon because I want the size of the flowers to complement the daisies. So, when I need different colors I have to cut the widest ribbons into 0.2" wide strips. Okay, so I unpacked and turned the ribbons lose. Unfortunately, they are all tangled and curled like the green ribbon shown in the picture. I'm glad the cat wasn't nearby. So, the solution is to iron all strips before cutting them. Set the iron temperature on low to medium heat. In order to avoid mistakes, cut a sample test strip. Put the strip under a piece of fabric and press, and at the same time pull the strip away slowly. Only when you adjust the iron to the right temperature to successfully flatten and straightening the ribbon should you iron all of the strips. After ironing, the ribbon becomes manageable. a. Choose any color to start. I selected the red color. For the first flower, cut 32 strips all 6" long. Put them aside. b. Cut 32 strips 5" long for the second flower. Put them aside. c. Repeat process for all colors. You have two sizes of flowers. You can always make a different size. For instance, 8" long strips will make a larger size flower. Now, let's move to next step. a. Take four 6" long strips. Fold each of them into two with one side 0.4" shorter than the other. This is to make sure when you fold the longer strip it will be equal in length. I'll use four different colored strips to make the instructions easy to follow as each petal is easily identifiable. I use the small clothes pins to hold them in place and to arrange them with the short strip underneath the long one. b. Now, connect the first two strips--the red and the navy blue ribbon--by inserting the folded red ribbon into the loop of navy blue ribbon as shown on the second picture. c. Next, take the folded yellow ribbon and insert it into the red ribbon loop as shown on the third image. d. Finally, loop the folded green around the navy blue folded ribbon before slipping them into yellow ribbon loop. e. Then, tighten them by pulling each folded strip away from the center. This will temporarily connect them together. You will still need the clothes pins to hold each folded strip in place. a. First, take the long green strip and fold it over the yellow and navy blue strips. b. Then, fold the long navy blue strip over the green and the navy blue itself as shown on the second image. (I put the clothes pin on top of the strips to hold them in place). c. Next, fold the red ribbon strip over the navy blue and the red. You can press along the folded area to create a line to help the strips stay in place. But, still you need something to hold them in place. d. Finally fold the yellow strip over the red and insert the end into green loop. Usually, it's hard for the yellow strip to go through the tight loop. With the scissors, trim the yellow strip end into 45 degree angle and insert it through. Then pull the yellow strip all the way through to complete the petal formation. Now, all strips are locked together. It should look like the fifth picture. I've made eight main red petals as shown in the last image. After you have your first batch of petals made, I will guide you to the next step. Right now, the petal tips don't look attractive. To make them look realistic, you need to trim each by cutting a 45 degree angle on both sides. The picture shows how they look after trimming. Since I ironed the ribbon into flat strips, the petals need to curve upwards to make a floral shape. Using the blade side of the scissors (or pliers), I place it on top of the beginning of the first two petals. With my thumb on the blade and a forefinger underneath both ribbons for pressure, I drag the blade. If I want the petals to curl tightly, before I reach the tip of the strips, I turn the side of the blade up and drag it. The ribbon will curl up as shown. Repeat this procedure to curl the other three sides of the petal assembly. Repeat for each of the seven sets of petal assemblies for a complete flower. Take a floral wire, and insert the end through the center of the flower petals. It should look as shown in the picture. Repeat for the other seven flower petals. When you're done, you now have a red flower! But, wait! One more step. You're almost there. Using pliers, bend the tip of the wire into a hook. This will prevent the flower from being accidentally pulled off the stem. Next, push the flowers all the way up to the bend. The bend will act as a stopper. Note: If the connection is not tight between all eight petals assemblies, they may slide down. You could add a leaf or leaves and wrap the floral tape around the wire. This will thicken the wire and secure the flowers and the leaf or leaves into place. The leaves in the picture belong to the daisies. I decided that the flowers I made resemble chrysanthemums and they share very similar looking leaves with the daisies. You can also make your own leaves using my previous Instructable. Through all the steps, you've successfully created your first flower! However, you need to make more flowers to fill in your vase. Repeat steps 4 to 9. Arrange all flowers in a vase. Since my floral wires are longer than the vase, I need to trim the lengths accordingly to create the preferred height. Be careful when you cut the wire with the pliers. Cover the excess wire with a towel prior to cutting, so when you cut, it won't fly off and hit your face. Finally, I added daisies to the arrangement as fillers. After all the hard work, you'll be rewarded with beautiful and colorful flowers for the summer. There are so many places in your house for this bouquet. For instance, you can put them on your desk, in the living room or on the dressing table. I hope this project will inspire you to begin making your own bouquet. 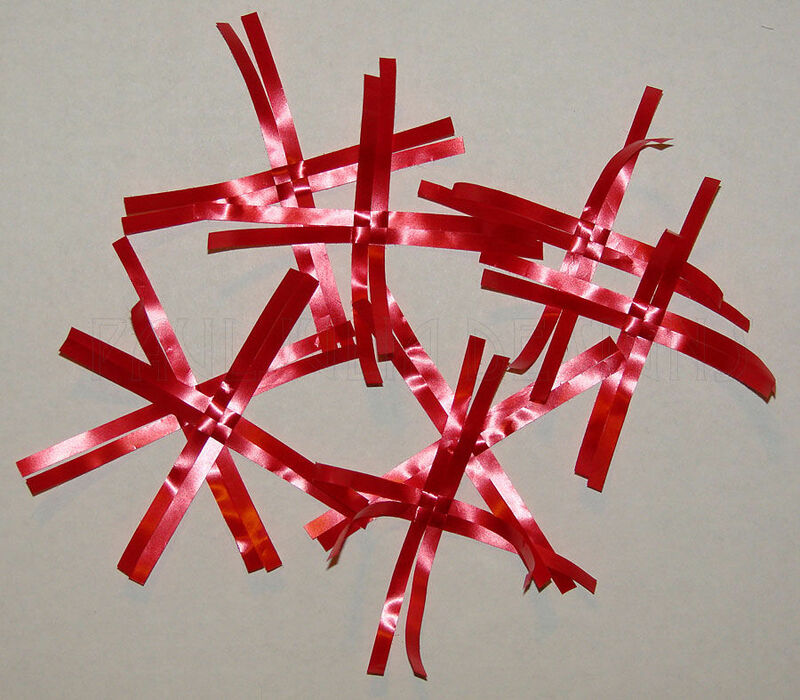 Other than ribbons, you could also use different materials, such as drinking straws. Enjoy! Aw! These are too cute and look like a lot of fun to make! v nyce...if v staple the mid,,result wud b same r not? Thanks! I'm sure it would work, as gift bows are stapled. I'd love to see how it turns out. These are very nice. I am going to try them on gifts instead of bows. Thanks.